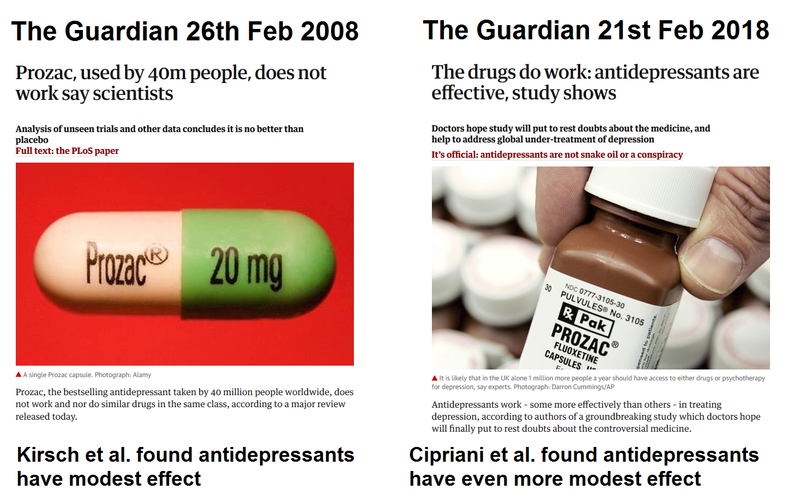 Consider this post a reblog of Neuroskeptic’s informative About that New Antidepressant Study. “I put his data in a Forest plot and ALL of the positive effect[s] by CBT [cognitive behavior therapy] could be explained by publication bias. Paroxetine was developed in 1975 and FDA approved for MDD in 1992. It was 2017 before we discovered the true data behind suicides in these trials. That is 25 years. The order of SSRI approval is fluoxetine-> sertraline-> paroxetine-> citalopram-> escitalopram. We know from court cases and other efforts that the suicide data for the first three are false. The reality is these drugs do not help depression much (if any) at all – their effect is to numb the emotions in most people. “Patients who take part in these drug trials have been on an antidepressant before the trial. They are then put on placebo for 10 days, a so-called washout. Then half the group, now in cold turkey wit[h]drawal, is now put back on a similar drug to what they had 10 days earlier, and the other group gets to continue their Cold turkey withdrawal. The fact that these studies are just testing relief from abstinence symptoms by taking a similar drug, could explain why there is no effect in children and young adults. Most people don’t realize that we are talking about statistical significance, and not clinical significance. The so-called significant difference between drug and placebo is approximately two points on the Hamilton depression scale. The difference has to be at least three for either patient or therapist to notice a difference. According to this study (https://www.ncbi.nlm.nih.gov/pubmed/23357658), changes of three points or less on the HAM-D correspond to ratings of “no change” on clinician‐rated global symptom severity.